New ABS-Equipped Model Available: For 2017, the FZ-07 offers the option of an ABS model to support the hydraulic disk braking system. The antilock braking system boosts rider confidence by preventing wheel lock-ups in reduced-traction conditions. Compact, Torque-Rich Engine: The FZ-07 features a compact 689cc liquid-cooled, inline twin cylinder, DOHC engine with fuel injection. This engine provides a unique power character, combining outstanding low- to mid-range torque with strong high-rpm pulling power. Crossplane Concept: This 2-cylinder engine features Yamaha’s "Crossplane Concept" 270 degree crank that provides linear torque development in response to the rider’s throttle input. The CP2 engine is also light, slim and compact and offers an excellent level of rider/machine communication. Compact Frame Design: A lightweight diamond-type high tensile steel frame provides an optimized rigidity balance for light, agile handling and stability. The engine is a stressed member of the chassis, allowing a lighter, more compact main frame design. 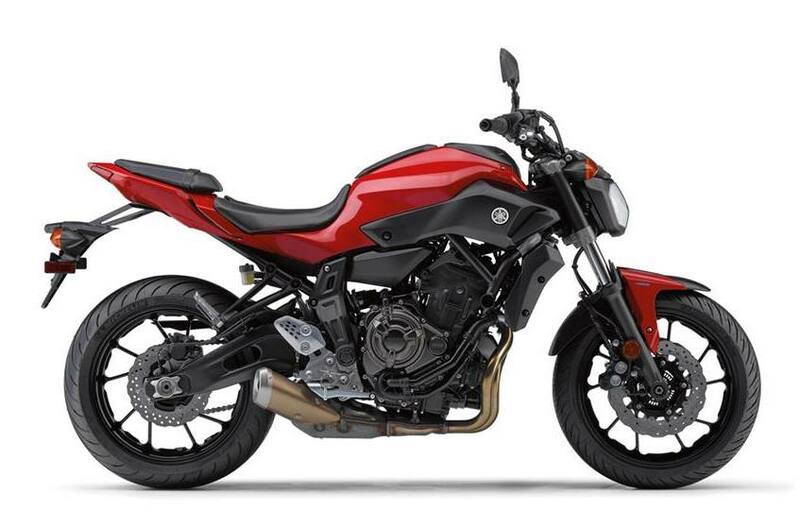 Advanced Twin Cylinder Engine: The FZ-07 features a compact 689cc liquid-cooled, inline twin cylinder, DOHC engine with fuel injection. This engine provides a unique power character, with outstanding low- to mid-range torque and very linear throttle response, combined with strong high-rpm pulling power. This motor develops 50 foot pounds of torque and is designed to maximize riding excitement in the real world. Crossplane Concept: The 2-cylinder engine features Yamaha’s "Crossplane Concept" 270 degree crank that provides linear torque development in response to the rider’s throttle input. The CP2 engine is also light, slim and compact and offers an excellent level of rider/machine communication. Compact Stacked Transmission: The six-speed transmission "stacks" the input/output shafts to centralize mass and to keep the overall engine size shorter front-to-back, which optimizes engine placement in the frame for outstanding weight balance. The transmission ratios are designed to bring out the best of the low- to mid-speed torque and excellent response characteristics while reducing the need for frequent shifts. Balanced Ergonomics: The riding position on the FZ-07 is one of the most important features, offering a balance between sporty handling and excellent rider comfort, thanks to its upright riding position. Street-Focused Suspension: The front suspension features a 41mm fork with 5.1 inches of travel, is tuned to provide a balance of comfort and control ideal for the street. Horizontal Monocross® Shock: The rear suspension features a link-type Monocross shock that provides 5.1 inches of rear travel. The shock is positioned below the seat and features an almost horizontal alignment, which helps make the chassis much more compact. The rear suspension includes spring preload adjustment, allowing the rider to tailor the settings to match rider weight or load. Powerful Braking: Front brakes consist of dual wave-style 282mm discs with powerful 4-piston calipers. Rear braking is handled by a 245mm wave-style rear disc. 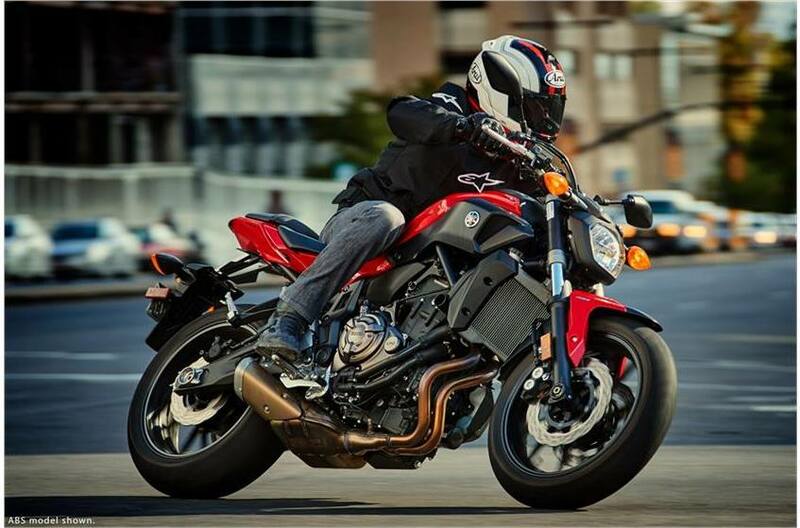 The FZ-07 ABS model features an antilock braking system to boost rider confidence and prevent wheel lock-ups in reduced-traction conditions. Lightweight Wheels: Lightweight cast-aluminum 10-spoke cast aluminum wheels reduce unsprung weight for great handling and suspension performance. The 17-inch front wheel is fitted with a 120/70ZR-17 radial tire and the rear wheel sports a wide 180/55ZR-17 radial tire. L x W x H: 82.1 in. x 29.3 in. x 42.9 in. Rake (Caster Angle): 24.8 deg.